Wowza! 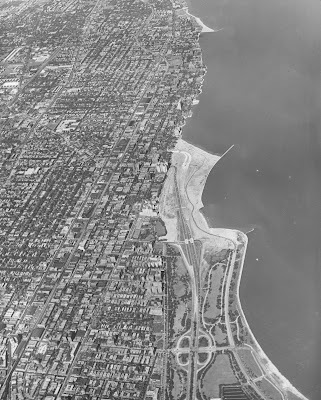 Although not in color, here is another terrific view of Uptown from the sky, with perhaps even more detail than the previous image we showed from 1928. You can clearly see the Edgewater Beach Hotel and Apartments, now cut off from the lake by the Lake Shore Drive extension. Other landmarks to look for are the Aragon Ballroom, the Uptown Theatre, and way to the north the Granada. (I can even catch a glimpse of the house that once stood near Argyle and Winthrop, where my condo is now.) Click on image, and then right-click "View Image" to get the full-size photo.